The C-2 Greyhound is based on the E-2 Hawkeye. They share the same wings and power plants, but the Greyhound has a widened fuselage with a rear loading ramp. 1964 saw the flight of the first two prototypes with production beginning the following year. 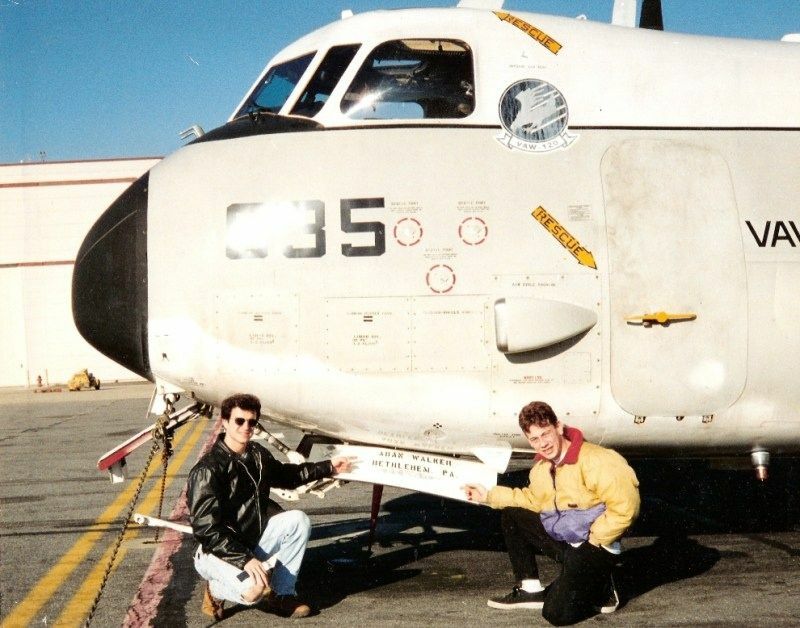 It replaced the piston engine driven C-1 Trader in the Carrier Onboard Delivery (COD) role. Overhauls conducted in 1973 were done to extend their operational life. The Navy ordered thirty nine new C-2A aircraft to replace older airframes in 1984. These were dubbed the (C-2A(R)) with the “R” standing for re-procured. This was due to the similarity to the original. However, the new aircraft has improvements to the airframe and a better avionics package. Older C-2As were phased out in 1987 with the last of the new models being delivered in 1990. Kinetics C-2A Greyhound comes on the heels of their equally large and impressive E-2C Hawkeye. This is a large kit in a large box with lots of parts; 190 according to the box top. While counting I came up with 250 …your mileage may vary. Suffice to say, it’s chock full! Parts are molded in a light gray styrene and feature nicely recessed panel line detail that is consistent overall. Rivet detail is provided and is not overdone. I found little to no flash on my example, but a few sink marks, and one or two parts had been damaged in transit. Paint call out are provided for Mr. Color, Hobby Color, and Vallejo. Both schemes are white over gray over white. Build options allow for folded or unfolded wings, closed or dropped rear ramp and a choice of eight or four bladed props and corresponding hubs. The cockpit is pretty sparse as far as detail goes but what there is will be hard to see once everything is sealed up. Maybe adding some foil/lead belts to the pilot’s seats could enhance this area a bit. The instrument panel features some soft raised detail, but again, will be hard to see once closed up. The interior of the rear cabin is very well detailed featuring radio racks, side wall detail and a full complement of rear facing passenger seats that will really add some eye appeal to this area once painted and detailed. There is still a lot more you could add if you want to open her up - but it would take a lot of work to pull it off. The front wheel well is merely a box with very faint details that the landing gear leg mounts to. This area could use some piping and or wiring to help breathe a little life into it…or you the builder can leave it as is as it isn’t visible from the ground. Main landing gear boxes are nicely done with rib details that will look good under paint and weathering. The main landing gear tires are separately molded styrene halves with a weighted look to them. It might be overstated in appearance, but I’m no expert. Some may wish to swap them out with resin when available. Study your reference photos. There are a ton of small antennas and “doo-dads” to add to both the top and bottom of the fuselage. Be careful when clipping them free, they are small and the carpet monster will have no trouble swallowing them whole. Step ten mates the previous assemblies to the fuselage along with the cockpit glass. The option of displaying the crew access door open or closed is offered in this step as well. Steps eleven through thirteen concentrate and the landing gear and engine nacelle assembly and provide the option of four or eight bladed props at this point. Two different panels for the engine nacelles are offered, but I am at a loss as to what one over the other is. Subject matter experts will no more. The parts in question are H15 and H17. Builders choice of flap configuration is provided in step fourteen to go along with the choice of fold/unfolded wings. Step fifteen mounts the completed engines/landing gear to the wing along with the position able tail ramp. The wings are added in step sixteen. Final assembly takes place in step seventeen with the addition of all the lumps, bumps and various antennas on both top and bottom of the aircraft. Overall this is a great looking kit of an important part of the US Navy fleet. It will take up a fair amount of real estate once complete so plan accordingly. I will more than likely build mine with the wings folded due to space constraints. I’m sure the aftermarket companies are in full swing mastering resin goodies for this along with lots more decal options. This should build into an impressive subject and garner lots of looks at contest tables. Thanks to Kinetic for the review sample. I made an error in my review. I stated that the rear ramp could be built up or down...not true. The kit only allows for ramp down. With the damaged parts I had in my review sample, I chose to build it ramp up as a fair amount of the internal framework would be visible and this is where the broken parts were located. I was going to leave them out and just button everything up. Only discovered that I couldn't build it ramp up when I got to that assembly step. I will make modifications to the parts/pieces so that I can. Sorry for any confusion this might have caused. Still a pretty impressive kit..."Q"
I worked my way around the rear ramp issues over in my build log. and there was much rejoicing...yaaaay. "Q"